Listed below are some editable SWOT analysis templates which you edit online using our SWOT analysis tool. After editing you can export it and include them in PowerPoint presentations(PPT), Word documents, Excel files or any other document critical for your organization. Use the below list to quickly navigate to different templates. Click on the SWOT template you like and we will open it for editing. 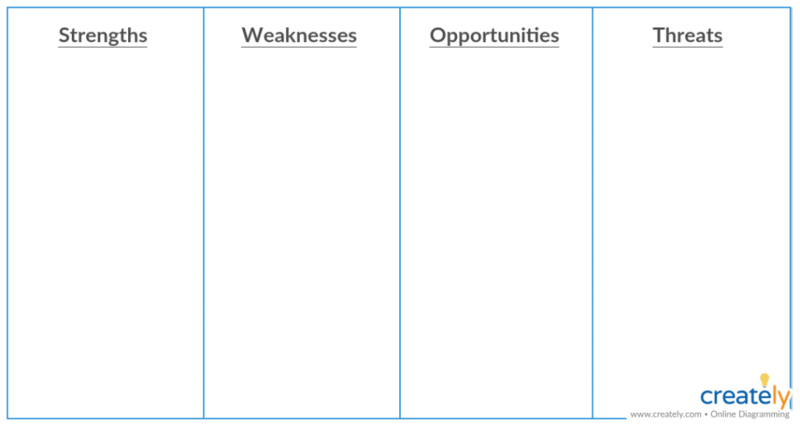 If you’re familiar with SWOT analysis you can get started right away using our blank template. Just click on the image and it will open in the diagram editor. After you add the data you can export it and add it to PPT presentations, Word documents or webpage. The box-like layout of SWOT analysis is not ideal for every scenario. For example, if you want to include a SWOT analysis diagram in Excel or any other document in landscape layout then the following SWOT template would be much better. Here the four factors are shown as columns. If you’re looking for a SWOT template for a printout our blank printable swot analysis template is a perfect choice. You can download it as a PDF file ( for high-resolution prints ) or modify it online using our tools. If you created it online you can access your diagram from anywhere and you always have a record of it. Alternatively, you can modify it and then download it as a PDF for printing. Another 2 x 2 SWOT analysis example but with a bit of color. Personal SWOT analysis is very important to criticize yourself and improve. They can be extremely important during job interviews as well. Especially so in internal company interviews where have a good idea who you’re going up against. 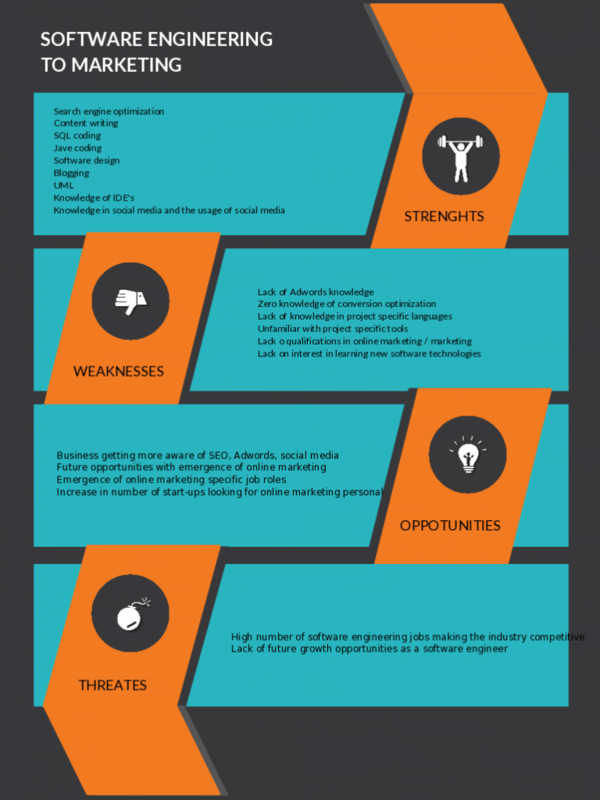 This is a SWOT analysis for Google, the number one search engine created by Alphabet. As the most popular search engine in the world, there are opportunities in the market and a competition to deal with while maintaining the business. 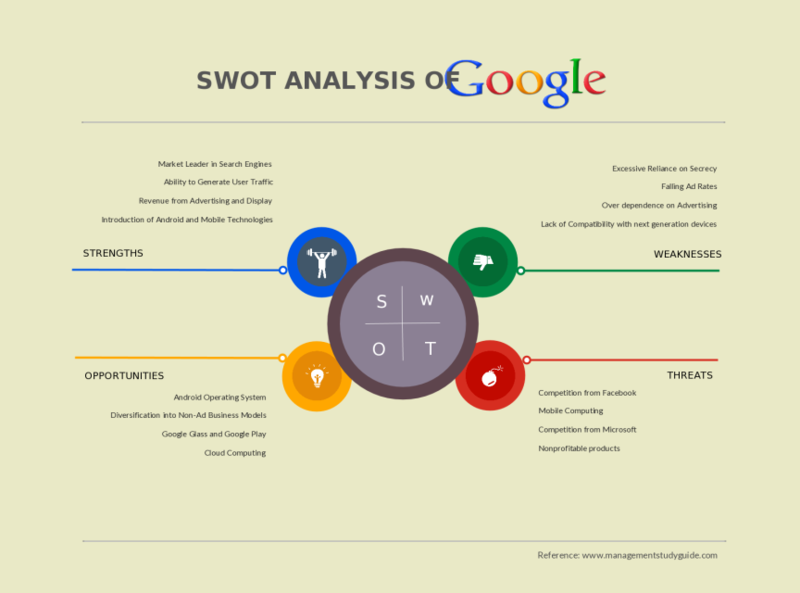 This SWOT analysis for Google is a good example for a giant cooperation’s model analysis. 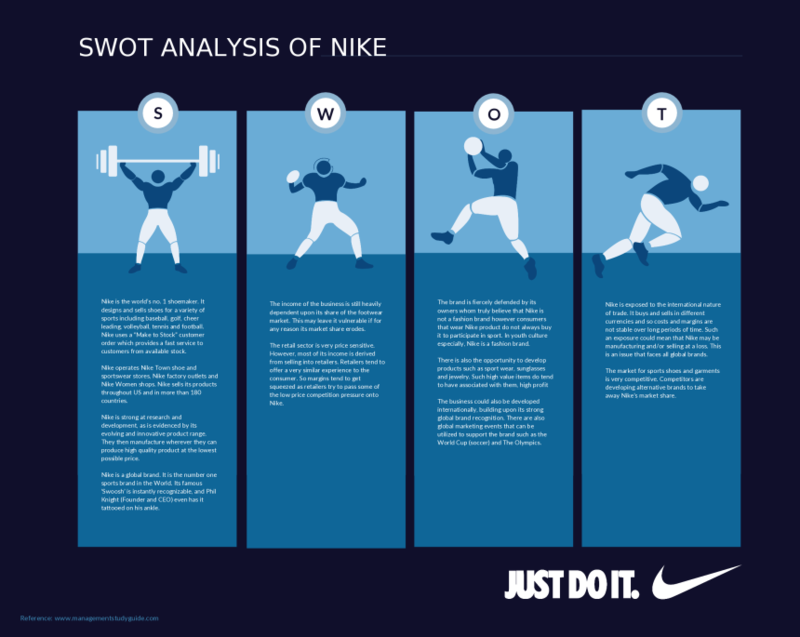 This customized SWOT analysis of NIKE summarizes its strengths and weaknesses as well as its opportunities and threats. 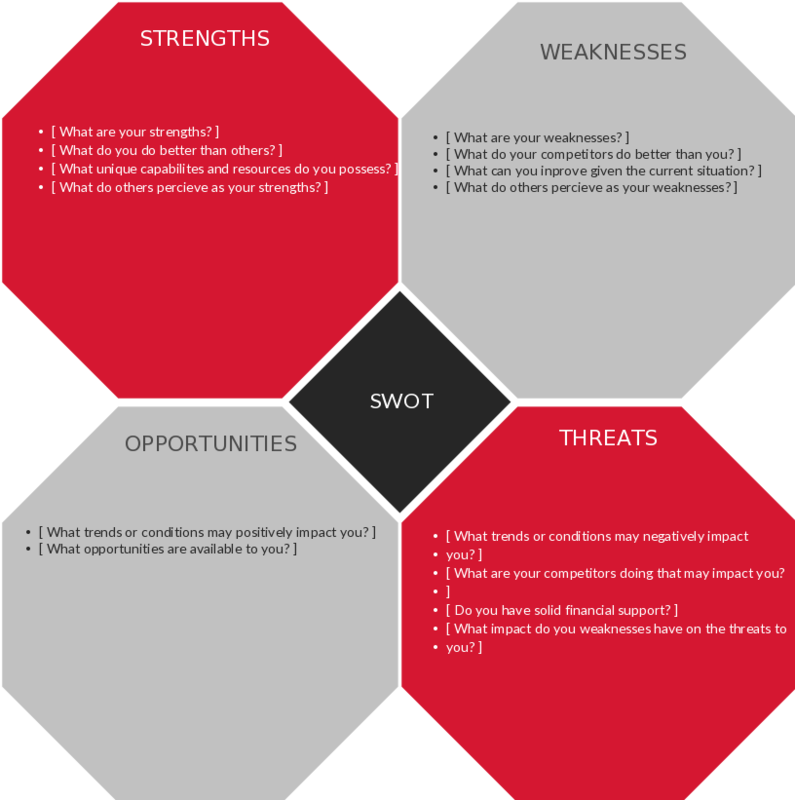 Any brand, universally popular or still new to the market, can use this SWOT analysis template to analyze the external and internal factors that may affect its brand authority and growth in the market. This is a SWOT analysis of Facebook. With over 1 billion users, Facebook has become one of the most popular social media networks in the world. A SWOT analysis like the one below can be used when it comes to evaluating their current position among their competitors. It is also useful when it comes to coming up with new strategies to increase their brand authority in the market. 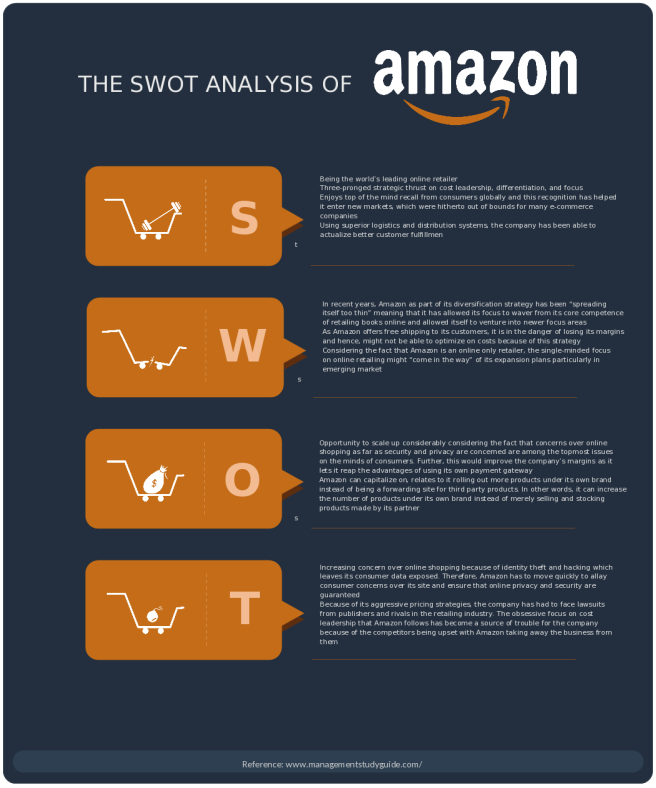 SWOT Analysis Template of Amazon Inc.
Amazon is one of the most popular e-commerce and cloud computing companies in the world. With the rapid increase in the industry of eCommerce and cloud computing, Amazon has come to face major competition from thousand other companies. Under such a circumstance, A SWOT analysis like this is very useful for Amazon, as well as any other company, to come up with new strategies to stay ahead of the competition and fend off obstacles on their path. Here is a SWOT analysis in the shape of a delicious burger for McDonald’s. As a globally popular chain of hamburger fast food restaurants, it has a brand name to maintain over 119 countries. When it comes to maintaining popularity among such a large number of customers, analyzing their strengths, weaknesses, opportunities, and threats is extremely useful. An analysis like this will help them figure out the factors they should improve upon and get rid of to keep their customers satisfied. When you usually make a big decision, like changing your career path from being a software engineer to a marketer, you always think it through by weighing the pros and cons. 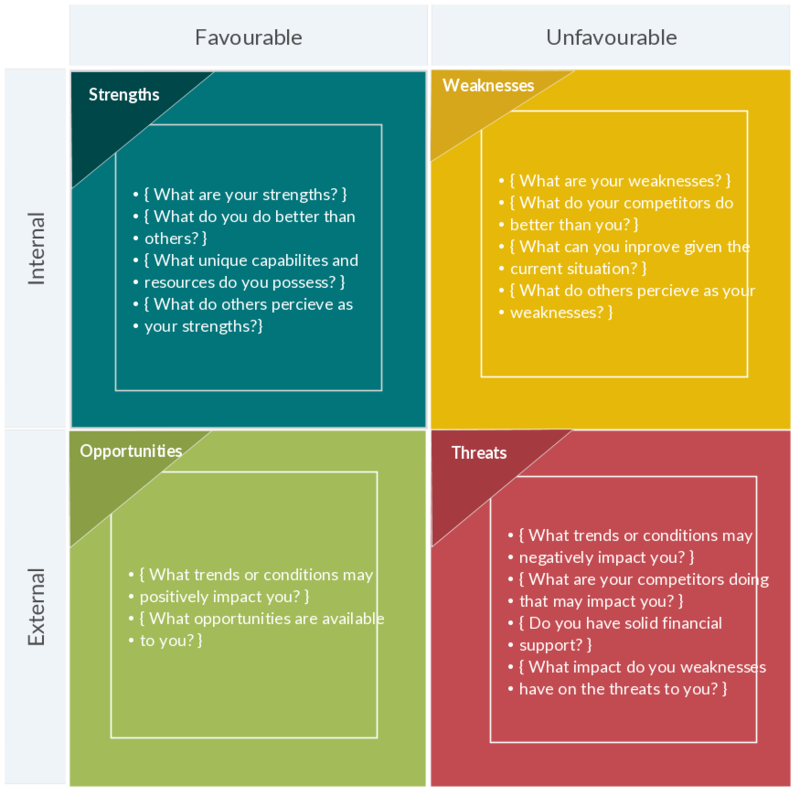 A SWOT analysis like the one below will help you arrive at a well thought-through decision by helping you see all the pros (strengths and opportunities) and cons (weaknesses and threats) of your big career change decision. Not so familiar with SWOT diagrams? Here’s a SWOT diagram with some actual data in it. 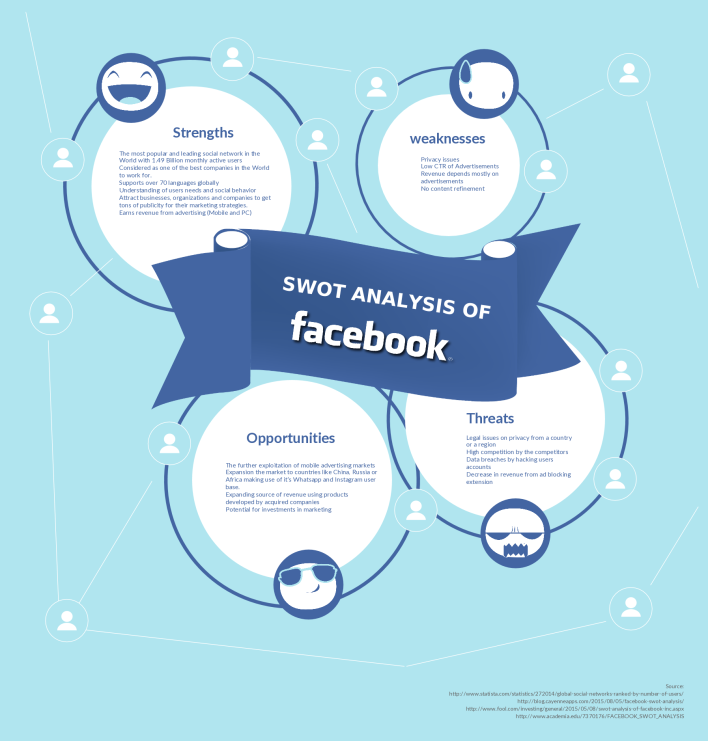 Check how they are listed and create your own SWOT diagram. If you want to use this template as the starting point, click on the image. A very simple template arranged as a 2 x 2 matrix. Most SWOT analysis templates come in this form. 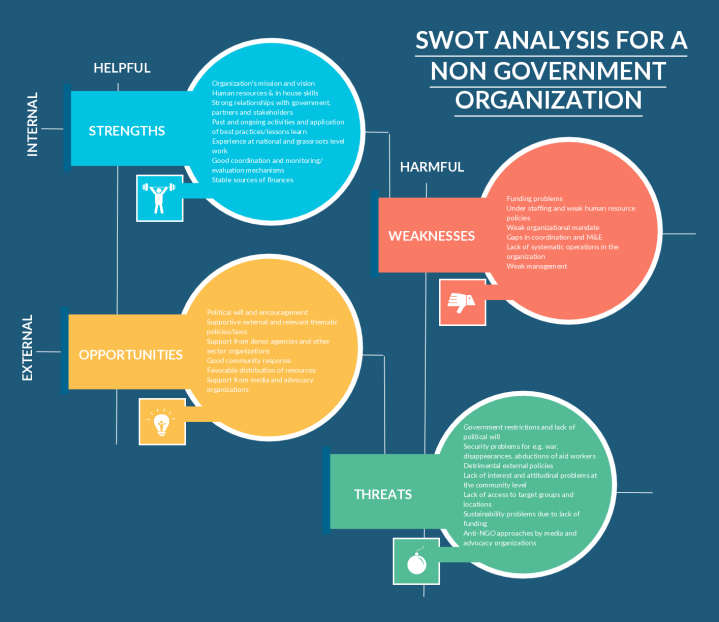 This one has added guidance to get started with SWOT diagram. And the color will make it easier on the eye. Click on the image to use this template. Don’t like squares? No worries. We got you covered with SWOT templates made using different shapes. 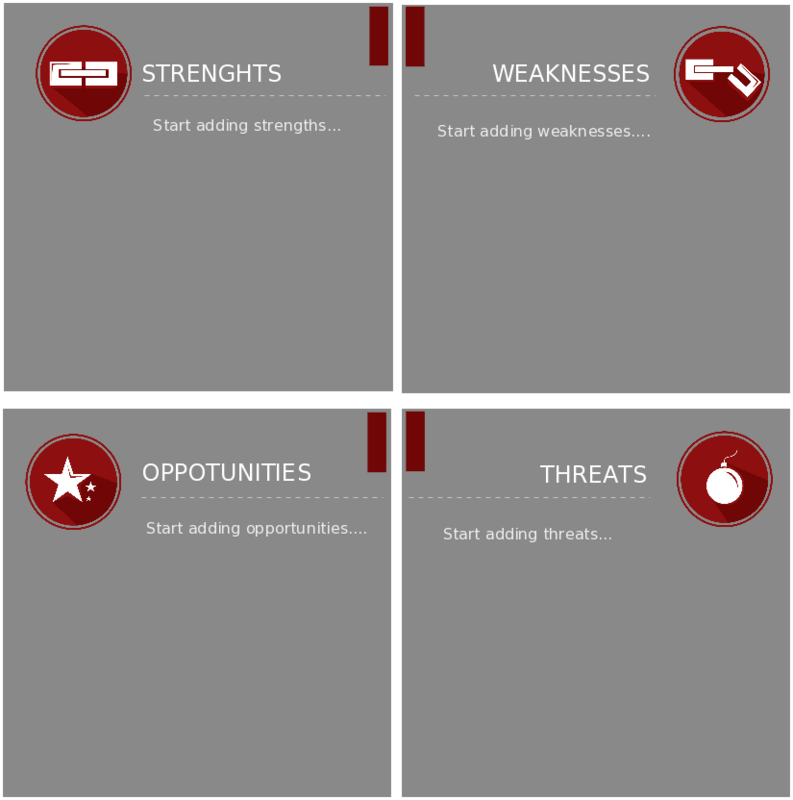 Below SWOT template uses circles, but we have rounded rectangles to octagons. Click on the image to use the below template. There are many more SWOT analysis templates. Below are some of the most popular ones in the community. Some of our users had some confusions about SWOT vs SLOT analysis templates. They are both the same. The only difference is that weaknesses are named as liabilities. SWOT analysis templates are one of the easiest ways to do a SWOT analysis of your project, business or the company. The templates are already done so you only have to fill in the details. Different color patterns, headings etc available in these template makes it very easy to come up with very professional SWOT diagrams in minutes. Mentioned below are some SWOT analysis examples available to you at Creately. This is an ongoing effort to educate our users about the thousands of diagram templates available in the Creately diagramming community. 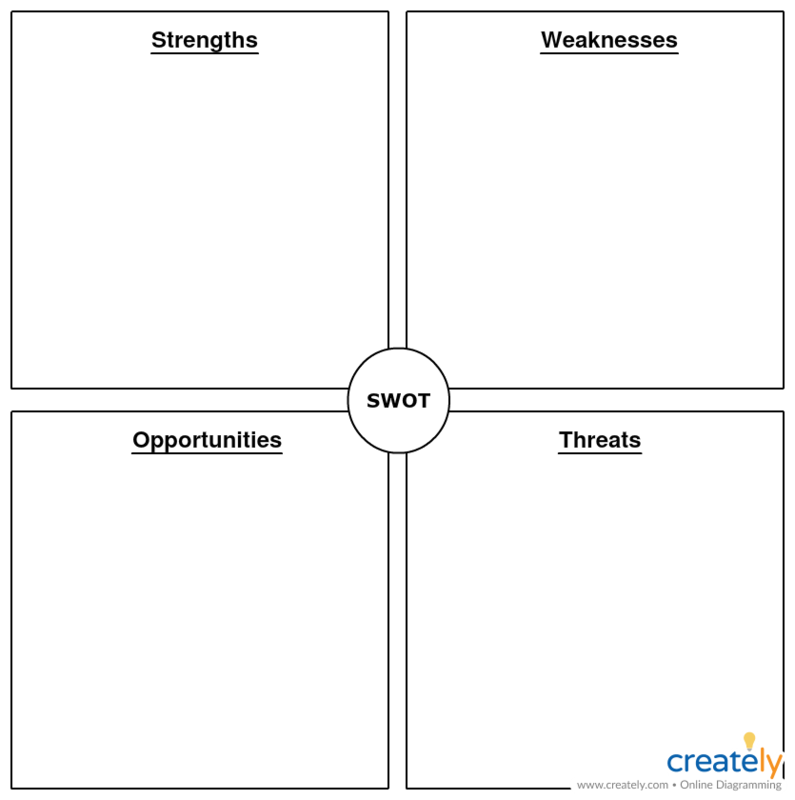 All the SWOT diagram templates shown below can be easily reused as a template. Just click on the image and we’ll provide you with everything else you need. Great article, thank you and keep up the good work! I read your tutorial the first time it is the great article I have never read this type article it is giving me an excellent knowledge of themes create, This section will share my friend, and I know very well there also liked your tutorial, Than you so much for sharing with an online community. I searching for this kind of templates for long …time!! I was confused with SWOT analysis and SLOT analysis templates.You explained it very clearly and effectively.Thank you for sharing. Very nicely elaborated and useful templates. Do you have example of SWOT analysis in maintenance business? Any template shown here can be easily edited to your requirement. You can probably get started with the blank SWOT template. Will consider adding one for maintenance as well. Can u pls give me swot example for sales manager position.. Thanks for these beautiful templates. They will help me a lot in doing case analysis as part of my curriculum. Thanks for those beautiful and useful templates. I am quite in love with these templates. A good work done. SWOT analysis vs SLOT analysis gives me a good tips. So far, I was wondering, that both were different with each other. I could find this definition only in yours. I remember doing SWOT analysis back in college days. I still end up using it daily. Thanks for the charts. Strengths and weaknesses are certainly internal. Although threats and opportunities are thought to be only external they can also be internal. Weaknesses and threats are different things. Then the picture may look more complex. tnx. for the additional knowledge about SWOT, more power! This is an impressive template. you are doing a good job by making this free templates. Nice, clean-looking templates. Templates are great, if people follow them! I appreciate the SWOT with actual data template. I have used graphics similar to these in the past for projects in the IT field. These templates would make great additions for presenting information in power points for potential shareholders.